Karawane Festival on Social Exclusion - No Lager! 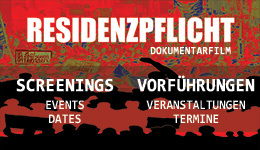 No Residenzpflicht! Unite Against Social Exclusion: No Lager! No Residenzpflicht! The German state exploits the refugees by collectively punishing us in the isolation lagers and with the apartheid-pass law in Germany, the „Residenzpflicht“. The German refugee „Residenzpflicht“ law is an apartheid-pass law that forbids freedom of movement for refugees from their forced discrete residences that are often located in remote isolated locations, often times in the forest and abandoned military barracks. It is a German colonial policy that was practiced in their occupation of Togo for example. This was continued under the fascist era of the National Socialist when the Nazi regime compelled the stay of certain foreigners to certain districts which they were only allowed to leave with a police permission else they were fined and imprisoned if they could not pay the fines. The similarity in the fines then and now leaves no doubt where this current law that has been in place since 1982 comes from. Let's overcome the fear and regain the freedom to unite against colonial injustice. Break the silence! We are here, we will fight! Freedom of movement is everybody's right. During the CARAVAN-FESTIVAL from the 4th till 6th of June 2010 in Jena there will be speakers' sessions for statements and speeches on social exclusion, residenzpflicht and isolation camps and the struggles and protest against these injustices.